The practice of yoga offers a beautiful journey of self-awakening and self-correction. Not that the journey is always pretty, or that the average yoga mat is of great help. If you enter a studio with any joint or limb pain, a slab of sheet metal provides similar cushioning. If you perspire (at some point of each class, you almost always will), your mat will feel better suited for a water slide than helping you to sustain poses. And a mat that causes frustration is counterproductive to say the least. 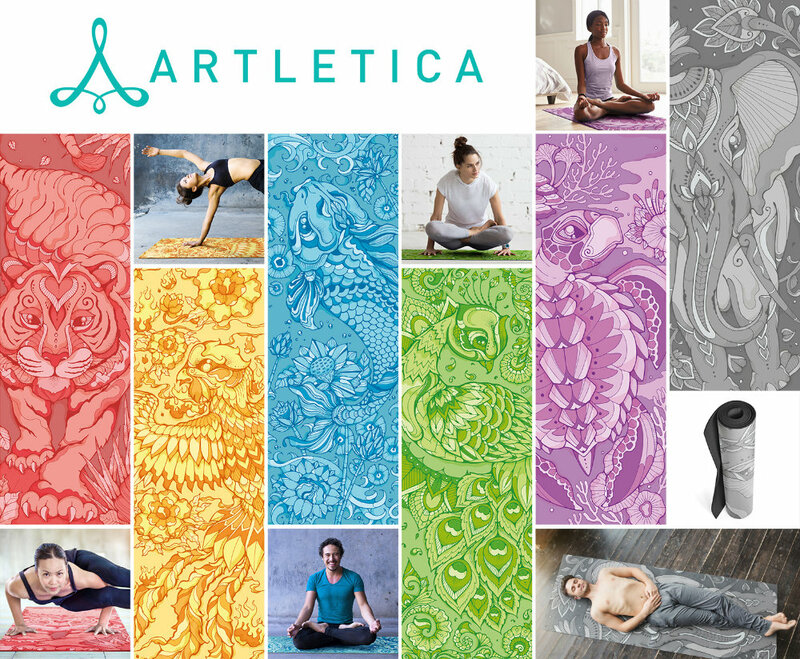 Which is why aspiring yogis will rejoice to learn about Artletica, an athletic products company specializing in artistically designed yoga mats and apparel. Not only are the designs beautiful, they introduce a new layer of safety. They’re printed directly onto the mats making the mats slip-resistant, unlike the typical mat’s ordinary micro-fiber surface. What’s more, the mats offer exceptional cushioning for greater support and comfort. Given that one definition of yoga is the resolution of all conflict, several yogis have no doubt found it… problematic to damage the environment for the sake of your own wellbeing. Artletica mats assist mindfulness in this regard as well. Each mat is crafted from the natural rubber of the Para rubber tree. Moreover, all mats and packaging are fully recyclable and biodegradable. We’ll have to watch the news cycles to find out if Artletica mats spark spontaneous chanting of Om, but people have already shown remarkable interest in obtaining these mats to enhance their yoga bliss. The Kickstarter campaign to launch the mats into the world surpassed its fundraising goal in under an hour! Explore rewards still available and to learn more about these eco-friendly, artistically designed mats by visiting the campaign here.